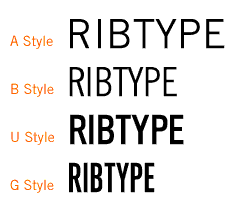 RIBtype Type Sets; One of the greatest things about RIBtype is its versatility: most anything can be made into RIBtype and can be changed as needed. Fonts with individual characters can be used to create messages character by character. If some of your text is permanent and only some needs to be interchangeable, logos and mats can help make your marking more efficient and result in superior impressions. "T Style" Assortment includes capital letters, numbers, and punctuation's marks. "F Style" Figure assortments include numbers, punctuation marks, and currency symbols only. "FA-VP Style" Figures only with a much larger count for a much better value. Type Styles: RIBtype ribbed rubber type sets are stocked in our four most popular styles; A, regular; B, condensed; U, bold and G, bold condensed. Sizes: Type sets are available in sizes ranging from; 1/16" to 2" in height. Sets in sizes up to 1" are usually in stock and ready for shipment.